spillyjane knits: Whooo is it? This is the Something from yesterday. 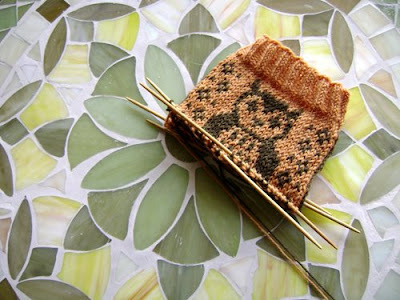 It's the beginning of my brand new Owlsocks sock pattern! I was hoping to have more of it done before I showed you but something's come up. All of a sudden I find myself in the middle of putting together a new pattern shipment for The Loopy Ewe and now I'm attached to my compy. So now I'm trying to knit on a sock, take pictures, print patterns and update the blog all at once! Fun! Expect to see more of the Owlsocks soon! I love it!! I think that they would make great mittens, especially for a child. Any chance you could make up a pattern for that sometime down the road? (Look at me, adding to your workload). March 17, 2009 at 5:33 p.m.
March 17, 2009 at 10:53 p.m.
March 18, 2009 at 2:24 a.m.
Can't wait to see it done - it looks great! March 18, 2009 at 3:22 a.m.
March 18, 2009 at 11:19 a.m.